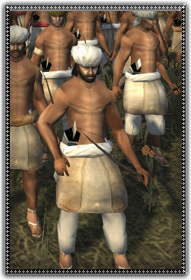 These are young men adept to hunting wild beasts in the Indian countryside, and are only comfortable using their own bows. They use longbows, giving them superb penetration power. Foes with no shield or who have their backs to these archers will surely suffer greatly. They pray to the mighty war God Kartikeya that they are not engaged by enemy horsemen.